Dubai-based Arabtec, a major contractor specialising in complex projects, posted a 20 per cent rise in revenue during the first quarter of 2013 to Dh1.55 billion ($421.8 million), driven largely by strong performance in Saudi Arabia and Qatar operations. Arabtec’s net profit of Dh99.7 million for the first quarter 2013 was consistent with the corresponding period of the previous year (Dh100.08 million). This represented a 6 per cent margin for first quarter 2013 compared to 3 per cent for the full-year 2012. The company, which built the world’s tallest building, the Burj Khalifa, experienced a strong quarter for new contract awards, with its backlog rising Dh735.8 million (net) over the period to Dh20.4 billion as of March 31. EBITDA was Dh131.2 million, representing an 8 per cent margin compared to 12 per cent a year earlier, as a result of executing on projects with lower margins awarded during the industry down cycle. This was offset by reduced SG&A expenses and increased other income of Dh40.2 million, primarily from the reversal of provisions, which enhanced overall performance. The company’s strategy of diversifying across the countries of the Gulf Cooperation Council is starting to yield results. Arabtec’s Saudi Arabia operations continued to drive the company’s revenue growth in the first quarter, accounting for over a quarter of total first-quarter revenue. Projects in Qatar are also growing in importance, accounting for over 10 per cent of revenue in the first quarter. The UAE continues to be a major market for Arabtec, accounting for over half of total revenue in the first quarter of 2013. 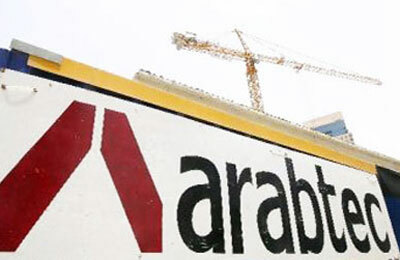 Arabtec’s gross margin in the first quarter of 2013 was a robust 12 per cent, compared to 10 per cent for full-year 2012. The construction industry in the Middle East is returning to growth and shaking off the residual effects of the downturn during previous three years as contracts were awarded with lower margins, a company statement said. Arabtec has embarked on a programme to reduce SG&A expenses by creating a shared services centre for its subsidiaries, integrating various units, implementing a group-wide ERP system as well as cost saving measures. The business is realising the effects of these measures with SG&A expenses decreasing by Dh1 million – or 2 per cent of total revenue – in the first quarter compared to the previous year. With a realignment of the business underway to improve efficiency, Arabtec identified certain accruals no longer required across its subsidiaries, which were reversed during the first quarter. The company will endeavour to target a dividend payout of at least 10 per cent for the 2013 financial year, the statement said. “Over the past six months we have realigned our businesses and continue to enhance our operations through a number of initiatives to increase efficiency and reduce costs, as well as hiring key individuals to further strengthen, lead and execute Arabtec’s growth strategy,” Ismaik said.